In just the three days of the Lao New Year holiday 159 road accidents occurred across the country resulting in 22 fatalities with incidents of drunk driving and speeding higher than ever. Vientiane Rescue 1623, under the Foundation for Assisting Poor People of the Lao PDR, presented the Ramon Magsaysay Award 2016 to the Lao people, after receiving the award in Manila, the Philippines, last month. Over 20 volunteers from Vientiane Rescue 1623 are performing drills to assist anyone in the water in preparation for this year’s boat racing festival in the capital next month. Vat Chan Festival is the largest boat racing competition in Laos and takes place annually the day after Buddhist Lent ends. This year’s festival falls on October 17. A senior officer with Vientiane Rescue 1623 under …. Over 700 people were killed in road accidents around the country over the eight months from January to August 2016. The Traffic Police Department under the Ministry of Public Security reported that 3,746 accidents were recorded nationwide during this time, involving 714 fatalities. Some 5,935 people were …. “Look at me, stay with us,” the paramedics shout as a barely conscious motorcyclist is bundled into a volunteer ambulance in the Laotian capital Vientiane, where rampant drink driving brings nightly carnage to the roads. It is a grim scene familiar the world over. But in Laos, an impoverished and …. 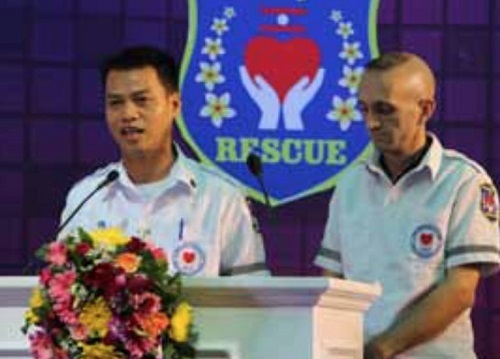 Vientiane Rescue 1623, a humanitarian group formed by volunteers to save lives in the Lao capital, is among the six recipients of this year’s Ramon Magsaysay Award, regarded as Asia’s equivalent of the Nobel Prize. Vientiane Rescue was set up in 2007 to provide first-aid services for free on roads in the Lao capital. Those behind it are a small team of students and ordinary people who began ….. In the blinding glare of headlights, the traffic keeps coming. Motorbikes swerve dangerously, cars drive down the wrong side of the road – it’s Friday night in Vientiane, the busiest night of the week on the Laotian capital’s roads. With the country’s economy booming, more people in Laos can afford motorbikes and cars than ever before – and they drive ….